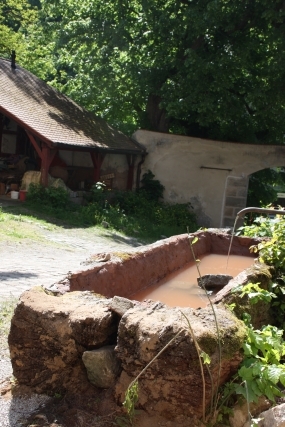 For the first time since 40 years, on 19 May 2012, the so-called horse fountain in the outer yard as well as the fountain near the palas began splashing again. The old oaken trough, dreaming of past times of triumph, had been running dry for long and was completely overgrown. It was sealed using clay and then it was: "charge the hose line". This was accomplished thanks to knight Domenicus Johannes Lapidarius de la Casa Giardiniera, who had been digging like a true berserk and laying pipes. This will not be forgotten!